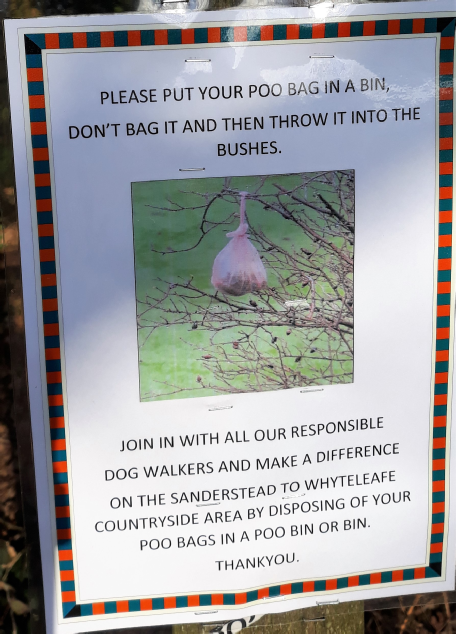 Also for the few owners/walkers who don't use one of the many dog waste bins on Riddlesdown's Open Space and like to throw the dog poo bags in the undergrowth or hang them on shrubs and bushes, which has resulted in the Council erecting these notices below. It is not the responsibility of our Street Champions, or other members of the public to pick up this dog waste.! Croydon Council's Neighbourhood Safety Team/Enforcement have been advised and are now patrolling the area. Someone has a sense of humour who has fixed this notice to a fence on the Public Footpath between Riddlesdown Ave and Purley Bury Ave. 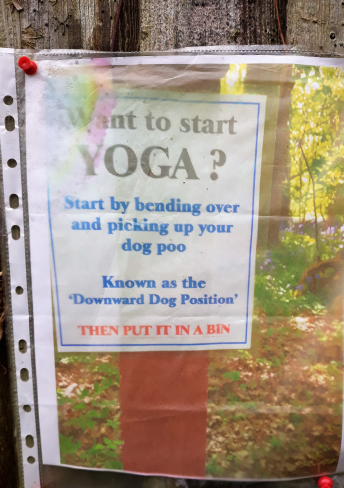 It is of course for the few dog owners who don't clean up, or dump the bags anywhere. But we know most dog owners/walkers are very good. Last seen 26 January with a reported sighting in the Riddlesdown carpark near Riddlesdown Rd. Still missing 5/2/19. She is a Parson's Jack Russell terrier with a green tartan collar and a named /phone number tag on it. She is micro chipped, unusually just above the left leg. Call 07932 700162 if seen. Yet again the RRA have received correspondence from a resident about dogs not under control on Riddlesdown 'Common' land. 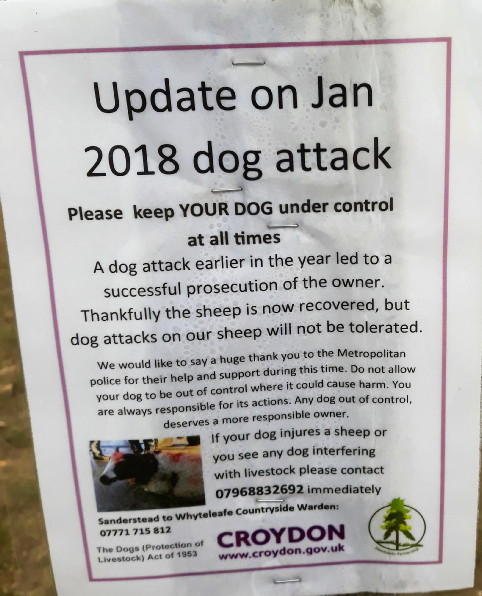 This particular incident would appear to have taken place on land owned by Croydon Council. This is an extract of the e-mail from the resident concerned: "I was running on the Common at 7.40 am this morning (Monday - 11/6/18) along the bridleway which has the exit to Warlingham school. There were two ladies walking away from me in front of me with 2 boxer dogs behind them. I called "excuse me" to them as they couldn't see what the dogs were doing and I wondered if they might jump at me. The ladies couldn't hear me so I slowed down, first of all the dogs ran towards me but past me so I continued albeit at a slower pace. Then they ran back behind me and jumped up at me. I am experienced runner and member of a running club, I know to stand still if dogs look lively and that is what I always do. I was extremely scared and shouted the ladies again. The 2 boxer dogs were barking and their paws were up to my chest. I was covered in their saliva up to the top of my arms. It was very, very frightening. The ladies had by now run back to me and I shouted them to call the dogs off. They grabbed them, shouted at the dogs and called one of them Rocky and I think at least one was a dark brown colour. As I ran off I heard one of ladies say sorry. I was going to turn round and take a photo as I always have my phone on me but I thought it might inflame the already awful situation. I told them I was going to report them. I probably should have done this on the spot, but just wanted to get home and out of their way. I was shaking and crying and covered in disgusting saliva. I had passed another lady dog walker less than a minute before who would have seen all of this. Frankly I could have written this email after other experiences in the past, but I try to adopt the attitude that the Common is large enough for us all and that anti social dogs are the minority but I'm just getting fed up. I go over that route less and less which is a shame. I am happy to run anywhere between Richmond Park and Lloyd Park but sadly its always Riddlesdown where there are problems." This resident has reported this incident to the Sanderstead SNT Police, City of London Corporation and Croydon Council. The RRA are sure many responsible dog owners don't need reminding, but it is an offence not to have your dog under proper control. And not all members of the public who use Riddlesdown land are dog lovers and some people can feel intimidated by them. Please keep your dog under control at all times. There are also a number of deer that now roam all this land and dog(s) have been seen chasing the deer for some considerable distance. "Would you please remind local residents in Riddlesdown that not all people are a lover of dogs. I was walking yesterday afternoon (26 June) down the public bridleway by Riddlesdown Collegiate when two elderly men had a dog (possibly a Labrador) off a lead and running around in the puddles. They saw me approaching and the dog had been jumping up on one of the men. When I got close to them, the dog came running over to me and the man shouted out “now don’t jump up”. Of course the dog ignored his command and did so. Not being a great dog lover, I was rather unnerved by this and did not know what the dog would do. The dog did back off when the owner came over. I then noticed the front of my shorts and blouse were covered in muddy paw prints! When I pointed this out to the men, I got no apology from them, just blank looks! Okay the dog didn’t attack me and was probably just being friendly but it was unnerving and owners should have their dog under control at all times in public places. Can you please remind residents that dog owners have a legal duty when their dog is out in public and they can be prosecuted if a dog “makes someone worried that it might injure them”. Thank you." Since 6 April 2016 it is compulsory for owners to ensure their dog is microchipped. Under the new measures all owners must ensure their dog is microchipped and their details are kept up to date. Not only will this mean the UK’s 8.5 million dogs can be returned to their owners more quickly if they wander too far from home, but it will also make it easier to track down the owners of dogs that carry out attacks on people. The RRA continue to receive reports that some aggressive dogs are not being controlled on a lead or muzzled and are attacking other dogs and even their owners. We have received many reports about this now and we have previously brought this to the attention of the City of London Corporation and Croydon Council, who are the two main land owners in the Riddlesdown Common area. The Police are also aware. Increasing numbers of deer have been seen roaming Riddlesdown Common and the adjoining Green Belt wood and scrub land. This is good to see. However, there have also recently been reports of dogs been seen chasing deer on a number of occasions. Unfortunately on Saturday 5 January 2013 at approx 9.30am, two Alsatian dogs were seen chasing deer which resulted in one doe being severely injured. The Police and a vet were called to the injured deer which subsequently had to be put down by injection. The Police at Sanderstead SNT are pursuing their enquiries to establish these dog owner(s). Dog owners are reminded to keep their dogs under control at all times when on the Common and to be prepared to encounter deer at any time. If owners have large and/or, any type of dog that is likely to chase deer, then they are urged to take measures, to prevent further attacks to deer. 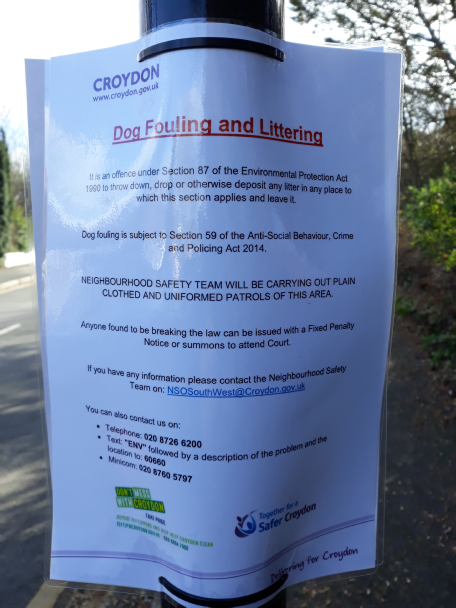 The RRA has received some complaints recently, about irresponsible dog ownership, by a few owners, causing a nuisance to Riddlesdown residents, especially continuous barking of dogs. Although the RRA cannot take direct action on behalf of the complainant, here are a few tips, some useful information and website links. Further information and some personal Riddlesdown related dog stories, can be found in the autumn/winter issue of the RRA Recorder. The RSPCA also provides a telephone advice and information phone line at 0300 1234 999. Legally, all pet (not just dog) owners have a duty of care under the Animal Welfare Act, to provide their animals with a suitable living environment. In public places for dogs, there are also various environmental and dogs acts and orders. These state that dogs must wear a collar with the owner’s name and address and it is a criminal offence for owner and/or the person in charge of a dog to allow it to be dangerously out of control. Owners have to clean up after their dogs and put them on leads when directed to do so and ensure that their dog does not worry livestock.